Information Security Risk Management Framework - Based on ISO 31010, NIST 800-37 and COSO 2013 best practices for managing cybersecurity risk. Federal Trade Commission (FTC) Act - 15 U.S. Code § 45 deems unfair or deceptive acts or practices in or affecting commerce to be unlawful - poor security practices are covered under this requirement and not managing cybersecurity risk is an indication of poor security practices! Massachusetts MA 201 CMR 17.00 - Section# 17.03(2)(b) requires companies to "identify & assess" reasonably-foreseeable internal and external risks! Vendor Contracts - It is increasingly common for vendors, partners and subcontractors to be contractually-bound to perform recurring risk assessments. Not having a risk management program could lead to breach of contract or losing a bid! For your internal staff to generate comparable documentation, it would take them an estimated 180 internal staff work hours, which equates to a cost of approximately $11,900 in staff-related expenses. This is about 3-6 months of development time where your staff would be diverted from other work. If you hire a consultant to generate this documentation, it would take them an estimated 120 consultant work hours, which equates to a cost of approximately $34,400. This is about 2-3 months of development time for a contractor to provide you with the deliverable. The RMP is approximately 4% of the cost for a consultant or 12% of the cost of your internal staff to generate equivalent documentation. We process most orders the same business day so you can potentially start working with the RMP the same day you place your order. 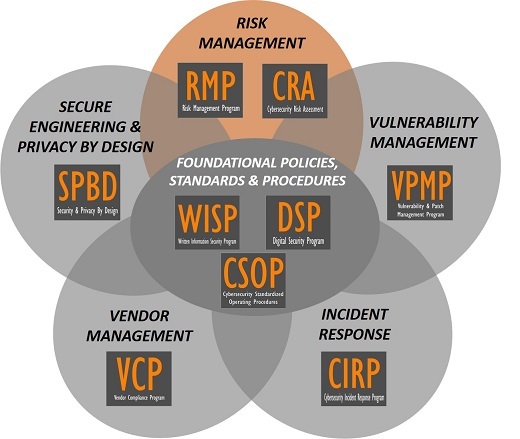 The RMP serves as a foundational element in your organization's cybersecurity risk program. It can stand alone or be paired with other specialized products we offer. When you look at getting audit ready, your policies and standards only cover the "why?" and "what?" questions of an audit. This product addresses the “how?” questions for how your company manages risk. The RMP provides clear, concise documentation that provides a "paint by numbers" approach to how risk is managed. 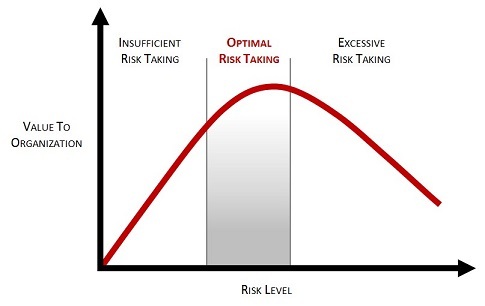 How risk is calculated by defining potential the impact and likelihood. 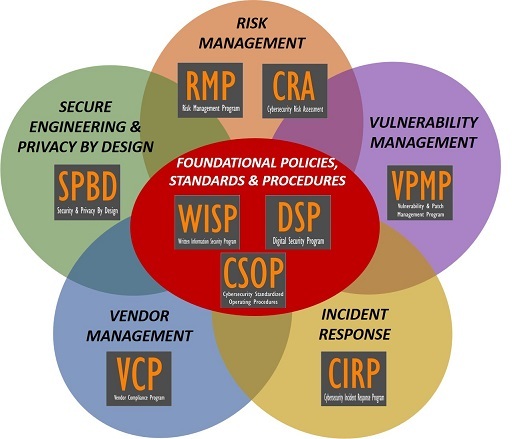 The RMP is based on leading frameworks, such as NIST Risk Management Framework (NIST 800-37 rev2), NIST 800-39, ISO 31010 and COSO 2013. Just as Human Resources publishes an “employee handbook” to let employees know what is expected for employees from a HR perspective, the RMP does this from a cybersecurity risk management perspective. What Problem Does The RMP Solve? Lack of In House Security Experience - Writing security documentation is a skill that many good cybersecurity professionals simple are not proficient at and avoid the task at all cost. Tasking your security analysts and engineers to write comprehensive documentation means you are actively taking them away from protecting and defending your network, which is not a wise use of their time. The RMP is an efficient method to obtain comprehensive risk management documentation for your organization! Compliance Requirements - Requirements such as PCI DSS, HIPAA, MA 201 CMR 17.00 and NIST 800-171 establish a mandate to formally manage risk. The RMP addresses these compliance requirements! Audit Failures - Similar to vulnerability management, most organizations run into trouble in audits when asked HOW risk is managed, since they cannot provide documentation beyond policies and standards. The RMP addresses the HOW for you! Vendor Requirements - It is very common for clients and partners to request evidence of a risk management program during their due diligence. The RMP provides this evidence! How Does The RMP Solve It? Clear Documentation - The RMP provides the comprehensive documentation to prove that your risk program exists. Time Savings - The RMP provides actionable guidance on what steps can be taken to categorize, calculate and manage risk in a sustainable manner. Cybersecurity Risk Management Program (RMP) Framework - Based on NIST 800-37 Rev2, COSO 2013, COBIT 5 & ISO 31010 Best Practices! The RMP is an editable Microsoft Word document that contains the requirements needed to establish a risk management program. Quite simply, the Cybersecurity Risk Management Program (RMP) provides your company with evidence that a documented risk management program exists to address operational risks associated with information and technology. From a Capability Maturity Model (CMM) perspective, if a risk program is not documented, incomplete or ad-hoc, it could be a liability for a company, since it indicates negligence with a statutory, regulatory or contractual requirement to manage risk. The RMP addresses the due care component of getting an organization to a mature level for managing risk. Organizations must take into account the probability of potential risks, since that identifies the legitimate threat landscape. 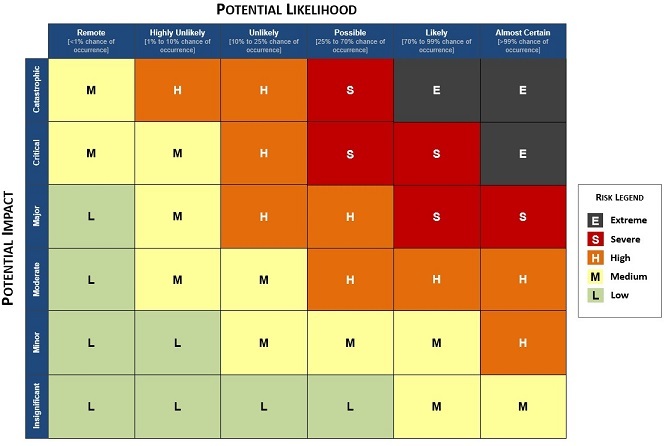 The results of this assessment, combined with the initial list of threats, will influence the determination of which threats require protection against because those are “reasonably anticipated” based on your unique situation. Organizations must consider the “criticality,” or impact, of potential risks to confidentiality, integrity, and availability of their data and information systems. Not all systems are equal – some systems could go down and no one would be impacted, but some systems could bring your business operations to an immediate halt. The RMP helps assess the magnitude of the potential impact resulting from a threat triggering or exploiting a specific vulnerability. This can be qualitative, quantitative or a combination of the two methods to measure the impact on your organization. From likelihood and potential impact, organizations can assign risk levels for all threat and vulnerability combinations identified during the risk analysis. The RMP allows you to assign a level of risk by analyzing the values assigned to the likelihood of threat occurrence and resulting impact of threat occurrence. The Cybersecurity Risk Management Program (RMP) provides best-practices guidance on risk management at the strategic, operational and tactical levels! 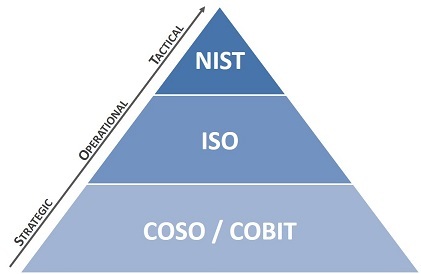 This is important, since this hybrid or "best of breed" approach to risk management takes advantage of the strengths of each best practice mdoel (e.g., COSO, COBIT, ISO & NIST). This allows you to have a considerable amount of flexibility to conduct risk management operations. Are you prepared to answer the "why" or "how" questions for your risk assessments? It is a pretty scary question for many people, since their risk assessments are not based on anything beyond “gut feelings” and are overly subjective. When an auditor comes knocking, it is critically important to be able to point to program documentation that justifies your decisions. The Cybersecurity Risk Assessment Framework is intended to be the foundational documentation that you implement to define and manage risk at your company. The Cybersecurity Risk Management Program clearly lays out and defines cybersecurity risk for your organization - how you plan to address risk management at the strategic, operational, and tactical levels! This is based on industry-recognized best practices for risk management from COSO, ISO and NIST, so the framework is based on what reasonable expectations are for managing cybersecurity risk. For simple risk assessments, the 6x6 risk matrix can be used to quickly identify the appropriate level of risk the scenario represents. With that knowledge, it is easy to then escalate the risk to the appropriate level of management for resolution (e.g., accept, transfer, mitigate or avoid the risk). Dependencies are of critical importance when assessing risk, since risk can have a cascading effect. Ideally, a risk assessment at a tactical level (e.g., assessment of a specific application or host) should leverage existing risk assessments that address “upstream” risks. For example, a well-designed and securely-coded application could be compromised if the host system it is running on is insecure. Similarly, the application could be made unavailable if the datacenter lacks measures to ensure uptime against natural or man-made threats. Our latest version of the Cybersecurity Risk Management Program (RMP) is a Microsoft Word document that is fully editable, so that you can customize it for your own unique needs.